but by the time this ad ran in 1948, he was clearing out stock. "SALE SALE SALE ROYAL ENFIELD 125 CC Cycles for only $99. Buy the 350 CC for only $199." That was the top of a classified ad placed in The Miami Herald on Oct. 29, 1948 by the R.S. Evans dealership in Miami, Fla. Sounds good. According to one inflation calculator that's less than $1,000 for the 125cc model and less than $2,000 for the 350cc. But there were some drawbacks. "These are full prices," the ad went on. "Some repairs needed. Some of these machines never sold. We sold over 1,000 at $269 to $599. First come — first served." Obviously the dealership was now clearing out its stock of unsold and returned Royal Enfields. These Royal Enfields were the 125cc Model RE (Flying Flea) and the 350cc Model G, imported to the U.S. in the first "British invasion" that followed World War II. Perhaps the post-war seller's market of 1946 was over by 1948. Or was it just the Miami market that had been saturated? If R.S. 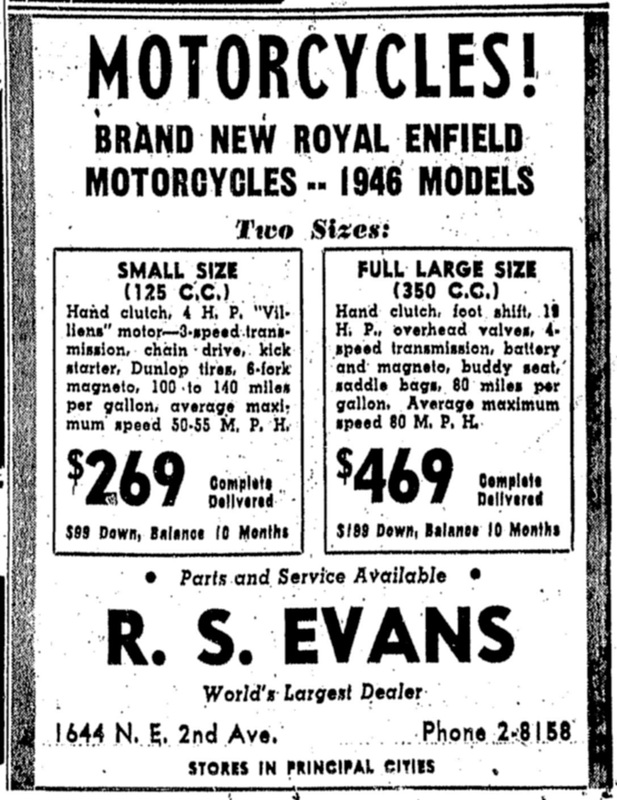 Evans really did sell more than 1,000 Royal Enfields in the years immediately following the end of the war in 1945 it probably did fulfill any pent-up demand. 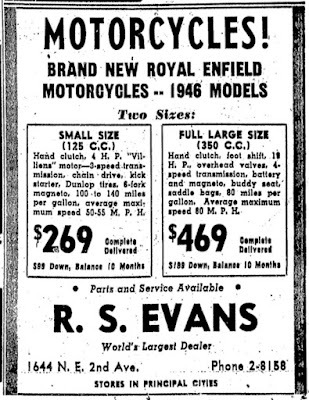 Post-war imports of Royal Enfields had begun hopefully, as illustrated by a bigger "display" ad from R.S. Evans in The Miami Herald of Aug. 18, 1946.
to customers who had done without during the war. On offer then were "1946 Models," the ad trumpets. The 125cc model features a "Villierns motor." (Probably they meant it the Royal Enfield motor had a Villiers carburetor.) The 350cc is nicely equipped if it really did come with a buddy seat and saddle bags. My inflation calculator indicates that the advertised $269 for the 125cc Model RE and $469 for the Model G equates to around $3,300 and $5,700 respectively in 2016 dollars. Not cheap. This makes today's models, with rear suspension and a better front brake, look like the real bargains.